Total of 8.5, 8 with Jake Larsen, Allie's brother-in-law. Jenny and Julia ran with William and Stephen. Jake and I ran first with Joseph and Jacob, and then just two of us. Also ran with Matthew on the little boy course, and he did not hold the hand. With Joseph, Jacob, and Jake. Murray Fun Days 5K, 17:45, 6th overall, 2nd master, $75. First time without Benjamin since 2013, but I brought Joseph (19:22), Jacob (19:41), and William (22:16) instead. I was happy with my race even though I got chicked. It is rather interesting, though, that in 5 of my last races that offered prize money I got chicked in 4, but got masters money in all. I suppose given a choice - get beat by a woman, or get beat by another master, especially a 55 year old, I would choose getting beat by a woman. What is interesting, though, is that before last year I had never won prize money of any kind - even as a master - in those circumstances. So the explanation is that for 3 out of those last 5 I traveled outside of Utah to a big race with a nice payout. But another part of it is that Utah is also starting to produce/attract top performers. My first mile was 5:42. I ran it fairly relaxed with Dennis and Mark. I tested them with a couple of surges and could tell that at least at that point I was a bit stronger, but not strong enough to drop them. Plus there was nobody close enough ahead except maybe Albert that I could go to. And even Albert was too far away, and it was just not worth it to even try. So I just ran with Dennis and Mark, trying subtly to egg them on to go just a little bit faster waiting for the "getaway car". The "getaway car" arrived shortly before mile two in the form of Andrew Blackham (Merrilee and Jason's son). I was able to latch on. He separated me from Dennis and Mark very quickly. The effort felt very hard and miserable, but I knew this was probably my best chance to escape. So I just kept telling myself, make it to the mile marker 2, make to to the starting line marker... I think I made it just a little bit past that. My split at the turnaround was 6:04, 11:18 at 2 miles (5:35 high), and 11:59 at the starting line. Then the real misery began. I reached my limit and could not go with Andrew anymore. I had to drop back, and now I was alone - a target for the wolves behind me. I was like my son Joseph when he was maybe 3 years old. He liked to sit and watch Benjamin, Jenny, and Julia play, and when the opportune moment arrived he would pounce on a toy they were playing with and run for his life. They would eventually catch him, but he gleefully enjoyed his moment of glory. I knew if it came to a sprint I would likely outrun Dennis, but not Mark. There was another "secret" wolf - Matt Wolpert. I did not even realize he was in the race - he started it late and ran 17:20 for the actual running time, but only 17:47 officially. So I hung on hoping for some rescue from the wolves which came in an unexpected form - Nan. She brought only one of the wolves with her - Dennis, but I was running scared and thought Mark was somewhere around as well. When she passed me, she was moving fast, but I knew I had to stick with her or else the wolves would eat me for lunch. So I did the best I could. I was about to drop back when we entered the park, but then told myself - hang on for the downhill. That decision was worth at least $25 if not the whole $75 of my prize. When I got to the top of the last hill I was very much ready for the race to be over. But it still had about 200 meters left. I said a prayer asking the Lord to give me the strength to not get passed, and was able to find another gear to hold my position. Joseph opened with 6:21, then it is not clear what his splits were. Jacob was with him at the mile, then dropped back. William's splits are unknown. We will see what the kids will do in Draper Days. Warm-up with Kenny the Apache. The race + waiting/jogging afterwards. Mile 1 - with Dennis and Mark. Mile 2 - mostly with Dennis and Mark, Andrew Blackham (Jason's and Merrilee's son) passed us and I latched on for a bit to build a gap. Mile 3 - full of drama. Got passed by Nan, but held off the old wolves. Kick - holding off a pack of wolves. Went to find William, but missed him. Searched far enough to exclude all even semi-plausible contingencies before returning to the finish. He actually finished in 22:16. Cool-down with Kenny the Apache. With Matthew on the little boy course. He insisted on going even though it was 100F. I figured half mile is short enough that this would not be dangerous, but long enough for him to learn to not insist on running in such conditions. It was tough for him - I think he learned. At night with Stephen on the little boy course watching fireworks. At night with Sarah to the park, 2 loops, and back - also watching fireworks. Ran with Jake Larsen today. Kids ran their usual distances on their own. We first paced Sarah through 2 miles down the canyon in 15:23 (7:44, 7:39). She learned that she can still do a tempo run at a decent pace even if she had had only 2.5 hours of sleep. This is a big deal - if Bella gives her trouble the night before Draper Days, she will still be able to race with confidence. Then Jake and I did 2 miles on the same course. The original plan was to go a little under 6:00, but I told Jake if he felt energetic and wanted to go faster I would respond. He took me at my word, and we ended up running 5:27/5:12. This is one of my fastest time of the season on that course. Definitely the split was good. The last mile might also be the fastest mile this year as well. I was surprised I had that much juice left after yesterday. Warm-up with Sarah and Jake. Back to the start of the tempo. Sprint time trials today. Joseph ran 100 in 15.0, Jacob 200 in 31.7, William 100 in 17.5, Mary (holding the hand) 100 in 38.4 - all PRs. Stephen's 20.3 might actually be a PR as well, if not, at least close. Matthew ran 0.5 on the little boy course in 4:02.8 - new record for not holding the hand. Jenny and Julia ran at the Girl's Camp. James Leblow (Ted's son) joined us for part of the run and help with pacing. He got back from a mission in St. Petersburg a year ago and is Russian is very decent. We spoke it most of the time. I did not have to correct him very much. My legs are tired from the last three days, today's sprinting was tough on them, they need some rest. On the positive side of things, at the age of 44 I could still sprint after two days of hard running prior - this is not something to take for granted. First mile with Joseph, the rest alone. Easy run today, in the morning with Jake and the kids (usual distances for them). Jenny and Julia ran at the Girls Camp. Ran with Matthew in the evening. He set a record in the mile without holding the hand on the little boy course - 9:03.6. That included stopping once because he thought he was too tired for which I did not stop the watch. Otherwise he would have broken 9:00, which he will probably do next time he tries. Also ran with Sarah's relatives Thomas and his mother Erika for a mile. She could only do it increments of about 30 seconds but covered the distance in 9:48. With William, Stephen, Jake + Bella and Mary in the stroller. With Jake, William, and Joseph + Mary and Bella in the stroller. With Matthew - false start, he forgot to go to the bathroom. Matthew's record mile run on the little boy course. Did a long run today with a 3 mile tempo in the canyon on the Draper Days preparation course (0.75 up, 1.5 down, 0.75 up). James Leblow joined me for part of the run, and did Joseph, and Jacob. I also did the follow-up evening run with William and Stephen (Jenny and Julia joined for part) because there was nobody to run with them earlier. I felt tired today. Probably the combination of the race on Tuesday, hard tempo run on Wednesday, and then sprints on Thursday. At the age of 44 I do not recover as fast from the sprints as I did 10 years ago, but I am thankful that sprinting still does not completely incapacitate me. Splits in the tempo run: 4:27, 8:32, 4:35. James pulled me for most of the last 0.75, but even with that help I did not have enough juice to average sub-6:00 pace on that stretch. Joseph and Jacob ran 6.69 miles with a tempo down the canyon - 5:50 for Joseph, 5:53 for Jacob. I stayed with Jacob. It was hot by the time we got out, around 85 F, so they both struggled. Jenny and Julia came back from the girl's camp. Julia ran 3.7, Jenny 4, in the evening. With Thomas, James, William and Stephen. Paced Sarah through her tempo run along with James. A jog with James up the canyon. 0.75 up, 1.5 down, 0.75 tempo. James helped me in the last 0.75. Back to the house with James. With Joseph and Jacob to get the car up the canyon. With Jacob down the canyon - Joseph got 5:50. Up the canyon with Joseph and Jacob to the car. With William and Stephen later in the evening to the bank and back. Part with Jenny and Julia. Usual runs for everybody, except I went a little longer so I could do Jenny's closing mile pickup. We did it in 6:36. 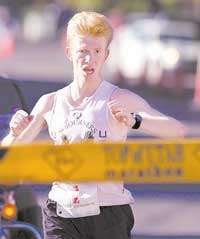 Julia ran with Matthew (0.5 in 4:04), Stephen ran with Mary. Paced the kids through their time trials. James Leblow helped me. Joseph and Jacob did 2K (Joseph)/1 mile Jacob. They ran together for the first three laps, then Jacob kicked, I went with Jacob, he ran a PR of 5:35.9. I then continued, but Joseph was lagging behind, so I slowed down to let him catch me, but he had a mental lapse and slowed down to maintain the gap until I really slowed down to the point where he had to catch me on the home stretch. We ended up with 7:07.8 for 2000. Jacob's splits: 82,83,84,83 high, the balance goes towards the 9.34 meter tax. William went through the first 800 in 3:06 struggling, but then really lost it. I stopped him at 1200, which was the deal - if he fails to check in with a low five at a checkpoint, he is done with the time trial. I want him and other kids to learn how not to sandbag to finish the distance, but rather run by faith focusing on the next checkpoint which I try to make challenging but reasonable enough so the failure - if it does happen - would have to be mental. Stephen ran 400 in 91.4, a bit off his record, but with more even splits. I gave William a chance to redeem himself from the mental collapse and gave him a target of 82 400, which he was able to hit. Then I ran 7 miles with Jenny with a pickup for 1.25 uphill after VPB in 7:11.7. That was a surprise - it felt easier than pacing Joseph and Jacob on the track earlier when it was cooler. Then at the end we did a mile fast finish on the little boy course in 6:35. I did an experiment yesterday by taking one 65 mg pill of Costco iron supplement. I do not know if it can act this fast, but what I was observing today is that I was sluggish to start, but once I got going I did better holding the effort than I normally do. Not sure what that means. Can iron be absorbed that fast? Paced Sarah through a tempo run - 2 miles in 15:20, then did 2x1.25, one uphill in 7:25, one downhill in 6:37. The uphill was very hard for the muscles, but I was able to run steady 89 with very little variation. On the downhill I think muscle power was the limit as well. This perhaps means that I am low on glycogen. Kids ran on their own. Afterwards I went to OpenWest conference, presented on MyISAM tables in MySQL, then played CTF (capture the flag) - a hacking challenge. A three day adventure that you could probably write a book about. Maybe one day I will, and maybe even before the kids are grown. Joseph and Jacob helped me earn some points by picking locks. With Stephen. I think somebody else ran with us as well. Warm-up with Sarah - for a portion. Did not sleep well, Capture The Flag challenges were bugging me. Went to bed at 12:30, then got up at 5:30. Solved a few, earned some points. Then usual runs with the kids over reduced distances (taper for Draper Days), did a pickup on the little boy course for 600 to catch up. Solved a wicked Capture the Flag binary executable problem that I believe was more difficult than anything I ever dealt with code-wise. Was the second person to solve it. For the geeks - the code that printed the flag was inside a hacked pre-main setup routine with the flag-printing branch being unreachable code. I solved it by replacing the relevant conditional branch with NOOP instruction (machine code 0x90) using a hex editor. After this I felt could go to bed and sleep peacefully. Managed to get to bed at a decent time. With James Leblow, William, and Stephen. With James, Stephen, William, and maybe somebody else as well. With James, and Jacob - I think. With Julia - mile pickup. With Matthew in the evening. Only 8.5 today to be fresher for Draper Days tomorrow. Reduced distances for the kids. Another day of Capture the Flag. One funny problem - Cow's Secrets. You hit a URL, it tells you to upgrade from Edge 5. You Google and figure out than the next one from Edge 5 was SymbianOS, so they want you to spoof a user agent for SymbianOS. You do that, now you see a cow that is asking for an oatmeal cookie. You fudge a cookie header that mentions oatmeal in the way the cow likes - took me a few tries. Then it complains the cookie has no raisins. You give it the raisins as well. Now it gives you a silly question, there is a most annoying Captcha that takes 5 minutes to get past each time. The questions keep changing. When you answer wrong, it insults you with something along the lines of "You are nothing, if you were in my toilet, I would not flush it!" You finally figure out the questions come out of the Linux command-line utility fortune, and next time look up the answer and paste it straight into the box. Then the cow finally gives you the flag. With James, Jacob, William, and Stephen. Easy run. Usual distances for the kids, I think. Total of 11.3. Did a tempo run up and down the canyon, 5 miles in 30:16 (6:18,6:20,6:08,5:48,5:42). Usual runs for the kids. Easy run. Usual distances for the kids. Jacob attempted a mile PR the day before turning 11, but could only managed 5:41.9. I ran 5:37.7 pulling away from him in the last 600 so he would have a moving target. James Leblow helped me pace. William, however, ran a PR in the 800 - 2:53.7, and Stephen ran 90.2 in the 400 - a small PR as well. Otherwise usual runs. Paced Joseph over 2000 in 6:59. This predicts 3000 in 10:28 at sea level in good conditions. Then paced Jacob over the same distance in 7:12. This predicts 10:48. Both of those times are 2000 PRs for them. Then did the rest of the distance. Usual runs for everybody otherwise. Ran 0.5 with Matthew at night. Paced Sarah through 2 miles down the canyon in 15:00. That is her new record. Then ran home, and ran 5 back to the car with Joseph and Jacob. Jenny and Julia ran with William and Stephen - usual Saturday distances for everybody. 0.5 with Matthew in the evening. Total of 10.5. Took it easy to be fresh for the Deseret News 10 K.